In this day's dialogue after seven years' meeting,the doctor's public lectureconcerning environmental policies at Soka University, his achievements as an authority of administration, contribution for the development of many countries of the world such as the restoration of Hiroshima, and his literary works became topics. Dr.Montgomery, an authority of administration and the first president of The Pacific Basin Peace Cultural Research Center of Soka University Los Angels has concerned himself with the economical development and assistant programs of many countries in the world. Among those achievements, he promoted the reconstruction of Hiroshima after he visited the city in the spring of 1946, which had been destroyed, to ashes by the first atomic bomb raiding in the history of mankind. Especially by planning The Peace Memorial Park, he dedicated himself to the construction of Hiroshima as the symbol of peace. 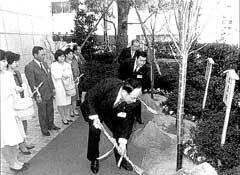 At a talk with the doctor in April 1991, Honorary president proposed to plant cherry trees to commemorate the honorable and distinguished achievements by him who made his best effort for restoring Hiroshima, the place of the origin of peace, worrying about the terrible sight by the A-bomb. Accordingly, we planted a pair of young cherry trees respecting his blazing soul of humanity and righteousness in the presence of Honorary President. We were filled with deep emotion.